Tolerance is undisputed as a social value that signals society’s humanity, maturity and stability – but tolerance has a market value, too. A striking instance of this is the significant spending power of the lesbian, gay, bisexual and transgender (LGBT) consumers – in societies tolerant enough to welcome them in their midst. 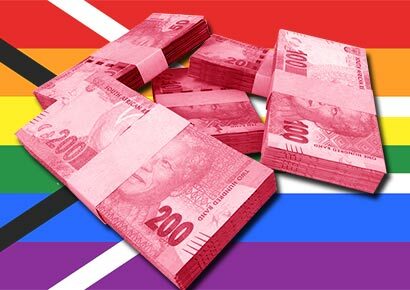 In South Africa’s case, there is sparse economic data, but researchers are confident that, based on international measures of LGBT household wealth and purchasing power, the Pink Rand packs a punch, underscoring the economic argument for tolerance and human rights. This much emerges from accumulated research contained in a special report titled “We’re queer and we’re here!” – the latest monthly edition of Fast Facts from the Centre for Risk Analysis at the South African Institute of Race Relations (IRR). The report reveals that while South Africa’s at least 800 000-strong LGBT community enjoys constitutional protection and is regarded with growing “open-mindedness”, lesbian, gay, bisexual and transgender people suffer high rates of discrimination, abuse and violence. But the cost is not confined to the human rights sphere, or only the LGBT community itself; given the significance of this community’s economic clout, there is a cost to the economy, too. IRR analyst and author of the report, Gerbrandt van Heerden, notes that, given that “economic data about the South African LGBT market is either limited or out of date … the IRR looked at other countries which have compiled data on their respective LGBT markets”. Figures from Witeck Communications, a leading strategic communications firm, indicated that the purchasing power of LGBT Americans, for instance, “is not just highly valuable to the US economy – $917 billion in 2015, up from $790 billion in 2012 – but that it also rivals the purchasing power of other large minority groups in the country”. The Pink Dollar, Van Heerden says, rivals the buying power of the African American, Hispanic and Asian communities in the US. Van Heerden adds that while more in-depth research is needed to “uncover the true potential” of the South African LGBT market, “the point to take away is that the Pink Rand wields a potentially similar share of total buying power in South Africa”. The pattern is evident elsewhere, too: the total household wealth of LGBT communities is relatively large across a range of successful economies, among them Canada (447 billion dollars), Italy (652 billion), Japan (1 289 billion), United Kingdom (1 014 billion), India (224 billion), France (825 billion), Germany (776 billion). Comparing two of the biggest – China (1 483 billion) and the United States (5 584 billion) – is instructive, in Van Heerden’s view. That the LGBT community’s total household wealth in the United States is roughly four times larger than in China “could reflect a more progressive attitude towards the LGBT community in the US, thus creating more economic opportunities for such people than in China”. In a 2016 Huffington Post article, Van Heerden noted that The Other Foundation’s “Progressive Prudes” report estimated that 1.4% of South Africans identified either as homosexual, bisexual or gender non-conforming. However, given the social stigma attached to homosexuality, the cultural or religious hostility in some communities, and the risks of abuse and violence in society, it was likely South Africa’s LGBT community was larger than surveys suggested, as a significant proportion of respondents could be unwilling to acknowledge their sexual orientation. Only 51% of black LGBT individuals are completely open about their sexuality. Applying American research consultancy Gallup’s determination that 3.8% of Americans identified as lesbian, gay, bisexual or transgender to South Africa, Van Heerden said the IRR estimated that the Pink Rand could be 3.8% of GDP or R152 billion (around US $11 billion). Michael Morris is head of media at the IRR, a liberal think tank that promotes political and economic freedom.